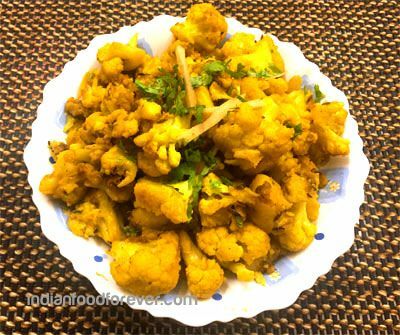 Aloo gobi is a very regular fare in any North Indian household. Generally the potatoes are fried and then cooked with gobi. This makes it unhealthy. So when going for weight loss we generally avoid this sabji and subsequently miss out on the goodness of this simple vegetable which can infact aid in weight loss. Gobi or cauliflower is high in fibre content which not only helps in easy bowel movement but also keeps you full for longer duration. It also boosts the metabolism which helps in effective weight loss. The only issue is when aloo gobhi is cooked with too much oil and spices that it loses it very essence. So to make aloo gobi healthy we need to use less oil and few spices. But trust me this cauliflower potato dry sabji is a sure heart winner. The trick to using less oil is that when the gobi(cauliflower ) starts sticking to the pan sprinkle little water like a tablespoon over the sabji and then cover it and let it simmer in its own steam. But you need to stir is very often as the sabji might start sticking again.Keep repeating the sprinkling of water time and again till the vegetables are cooked properly. Definitely one can say for sure it requires constant monitoring but the final outcome is very tasty and healthy too. Though cooked with little oil and few masalas the taste is not compromised at all. Infact it tastes better. And one can eat it without guilt on a regular basis. There is minimum use of spices but the addition of black pepper simply adds a rustic touch to this simple dish.This low calorie aloo gobi can be included in lunch or dinner as you like. Try it out. Once you get the idea of cooking with water you can use it with any vegetable. So here is the process. Peel and chop the potatoes into cubes of desired size and keep it dipped in water till further use. Wash and cut the gobhi also into florets. Heat oil in a kadai/pan and add jeera seeds. When they begin to sputter add the julienned ginger and fry for 1 min. Then add haldi powder and immediately add potato cubes. Stir constantly or they will begin to stick to the bottom. Add salt and now let the potatoes get little tender. If you want you can cover the pan but remember to check of and on. If you feel that the potatoes are sticking to the bottom then sprinkle 1/2 tablespoon of water on the potatoes. Once the potatoes are half done add the cauliflower florets and ajwain, stir and mix properly. Cover the pan and occasionally check on the cauliflower. Let it cook in its on steam. If again the vegetables start sticking sprinkle 1/2 tablespoon of water, stir, cover and cook again. You can repeat this process of sprinkling water till the gobhi and aloo both are done. Remember to stir gently or the florets will crumble and make gobhi pulpy which is not a good sight. The florets should hold it's shape. Now turn off the flame and spinkle green coriander and black pepper powder. Dish it out in a bowl and garnish with ginger juliennes. Note: Ajwain is optional. But ajwain not only adds flavour but also reduces the gastric properties of cauliflower. It is more beneficial if you are making aloo gobhi for dinner. ajwain aids in easy digestion.